Titus Software seems to have a great love for racing games. Its first game, Crazy Cars, which I reviewed several months ago, was a standard car-race "simulation" that was lacking a lot of the flare that makes for a great game. It certainly couldn't compete with Data East's excellent Speed Buggy. This time around, Titus has changed the cars into speedboats and the scenery into futuristic landscapes. Along the way it also added a little firepower to the boats, and the result is a game that, though not particularly original, is far superior to the first offering, and one that I can recommend (although, just like Mindscape's Space Harrier, I think the price is a wee bit on the high side). The scenario goes like this: The entire universe has been taken over by a group of "Extraterrestrial Pacifists," and they have banned all things violent. Their Peace Doctrine is the law of the galaxies. A noble venture, eh? But then along comes the Off Shore Warriors who have decided that all this love-and-peace stuff is too much to stomach. They invent a new sport that involves piloting speedboats down treacherous channels, while killing off all opponents in any manner possible, including blasting them with missiles or forcing them onto the rocks. Now, although you might think that as the player it is your job to bring peace back to the universe, to bring all the powers you have at your command down on the heads of these evil people who find killing more sporting than family picnics, the fact is that you are one of the Off Shore Warriors, and your goal is simply to wipe out your opponents and win the race. As I said, the Off Shore Warriors drive speedboats, not cars; so obviously some changes had to be made to that aforementioned "traditional racing-type game" to make it compatible with the new scenario. But not too many changes. Instead of driving your car down a two-lane road, you're piloting your boat down a channel in a lake—said channel marked off by orange markers. If you allow your boat to slip out of the channel, you'll likely find yourself colliding with a rock. Other than piloting your boat down a channel, nothing else in Off Shore Warriors (except the ability to shoot) is particularly different from the traditional racing games. 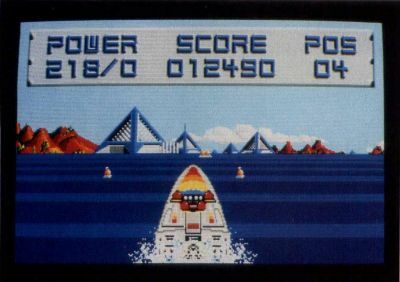 The image of your boat stays at the bottom-center of the screen, while the rest of the scenery flows toward you, shifting left and right with the movement of the joystick to simulate the steering of the boat. So if you're a fen of racing games, you'll probably get a kick out of OffShore Warriors. If you've grown tired of this type of game (it has been done 100 times before, after all), then maybe you'll want to skip this one. On the other hand, you might find it great fun to blast your fellow racers out of the water—enough fun to make up for the game's lack of originality. Does that sound like fun?